Today’s new normal requires having an emergency plan in place. Hurricanes, fires, and other natural disasters – cities and businesses alike need to be prepared so they can help customers and citizens in the quickest, most efficient way possible. It’s a business leader’s worst nightmare—a natural disaster is headed for your area, and you need to keep your family, your customers, and your business safe. How do you manage customer communication to make sure everyone is aware of the situation and customers stay happy? That was the dilemma faced by South Carolina Federal Credit Union recently as Hurricane Irma threatened landfall. Its experience can be considered a case study of how to manage real-time customer communication in difficult times. 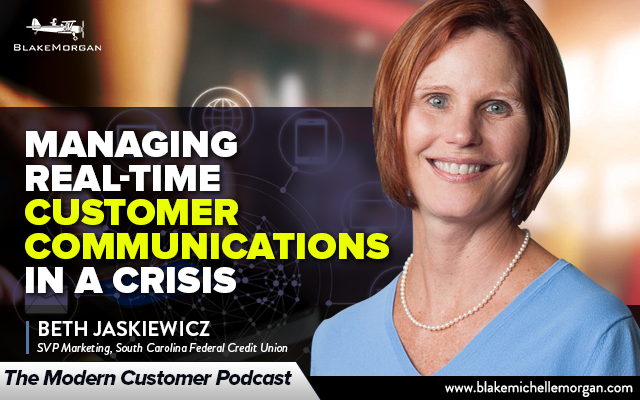 Customer communication is always important and plays a large role in the overall experience, but it perhaps is never more important than when companies need to share information with their customers during a time of crisis. Circumstances can change quickly, so being able to deliver accurate, quick, and concise messages is crucial. As the hurricane neared, South Carolina Federal Credit Union had to share when it would be open and how customers could access their money and other financial services. According to Beth Jaskiewicz, Senior Vice President of Marketing, the best thing to do for a crisis is to be prepared. The credit union has a business continuity plan and started planning on how to put it into action about two weeks before Irma was scheduled to make landfall so that customers could still manage their money and wouldn’t have their financial services interrupted. The widespread plan included everything from the possibility of delays in delivering cash to ATMs to power outages and setbacks in running the business. Senior management met with the business continuity team daily to stay updated and fine-tune their plans as weather forecasts changed. Throughout the entire process, credit union employees considered what it would be like for customers if the hurricane did hit. What would customers need to know, and what would the credit union need to do to make them feel safe and secure? During a crisis, a consistent message is key so customers didn’t feel they were getting a different story depending on the channel they are using. Choosing the right channel to communicate with customers is important. During times of crisis, it is easy for people to get bogged down with too much information, so the most effective communication from a company involves just the basics of what customers need to know. In the case of South Carolina Federal Credit Union, this involved sending short text messages and emails with updates about when the branches would be open or closed and then directing customers to the website or social media channels for further updates. Companies should also consider who needs to know the information. During Hurricane Irma, all customers needed to know, but other crises and situations might call for smaller, more targeted groups to be notified. Effective customer communication during a crisis really comes come to organization and collaboration. Beth recommends planning before disaster strikes and walking through various scenarios with key leaders to put a plan in place. Everyone in the organization should have a clearly defined role with a backup person in place in case something happens. Some disasters, like hurricanes, provide some sort of warning, while other crises can happen without any warning. Crises are unexpected and can wreak havoc on companies, but having a plan in place to communicate with customers seamlessly can make all the difference and turn a potentially chaotic situation into something that is calm and organized. Staying on message and being concise can help strengthen your customer experience, even during difficult times.